Many people are not aware that Anne Bronte was the youngest of six children. Her parents were Patrick and Maria Bronte. Her eldest sibling was Maria, followed by Eliza beth, Charlotte, her brother Branwell and then Emily, before Anne was born in 1820. Anne was only a baby when her mother died shortly after the family moved to Haworth Parsonage – her eldest sibling was just seven years old. 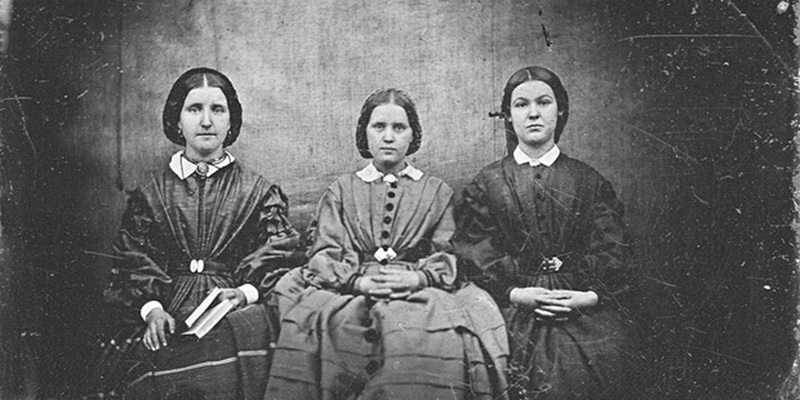 Anne’s sisters were sent to school three years after the death of their mother but Charlotte and Emily were brought home in a hurry after Maria and Elizabeth both contracted tuberculosis and died. They were just 11 and 10 years old respectively. A few years later Charlotte was enrolled at Roe Head School and when she returned home a year later she acted as a tutor for her younger siblings. Charlotte went on to become a teacher at Roe Head, taking Emily with her as a student. However, Emily only lasted there for three months, returning home because of severe homesickness that led to her becoming extremely ill. Anne then attended the school for two years. Emily went on to become a teacher herself but she disliked the work and missed home. She did, however, spend time in Brussels with Charlotte at the Pensionnat Heger, where they were pupils and studied languages, writing, singing, music and art. It was the death of their aunt who had helped to raise them that brought them home again, and while Charlotte later returned to Brussels, Emily chose to stay in Yorkshire. Charlotte’s time in Brussels came to an end in 1844 when it was suspected that she had fallen in love with a married teacher. She was also not happy with the students that she was teaching as she found that they lacked manners, intellect and kindness.